This card was challenging for sure. Once you learn how to cut your spiral, putting it together is not a problem. The challenging part is figuring out colors and what to put on you spiral inside. I always seem to do Project Tuesday on Sunday and I'm very late tonight, so without further explanation my list of challenges will have to explain themselves. I always make them clickable so you can visit the challenges I enter and not only see how I have interpreted the challenge, but alot of other very talented artists as well. Our Creative Corner OCCC-Blooming Blossoms! 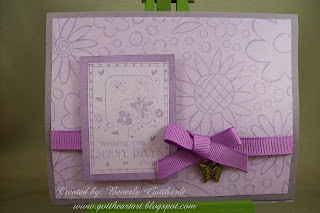 Supplies: 4 1/4" X 5 1/2" card, Papers: all from scrap stash, Stamps: Inkadinkado-99520Boxed Wishes, The Paper Studio-Make A Wish, Ink: CTMH-Z2161 Petal, Cuttlebug die-Flowers, Stampin Up-Sizzlits Little Leaves, Stampin Up-Hodpodge Hardware, Plaid-butterfly charm, American Traditional-ribbon, glue dots, pop dots. Wow Beverley - your flowers really do 'pop out' and look really pretty. Thanks for playing along at Project Tuesday - glad you could join us. Great job on the spiral pop up!!!!! 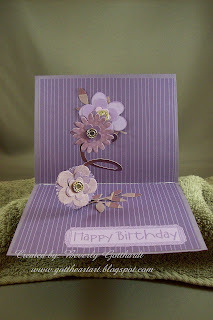 Such a pretty card, and I love the flowers inside!!! Oh...and cute butterfly charm!! Thanks for playing along with us at Project Tuesday!!! Very clever card, love the colours, flowers and charm and great links too!! Thank you for joining OSAAT'S 'Flower' challenge, hope to see you next time too! well you have rocked the PT challenge again girl :) this is so pretty and i love the flowers :)thanks for playing along this week!! 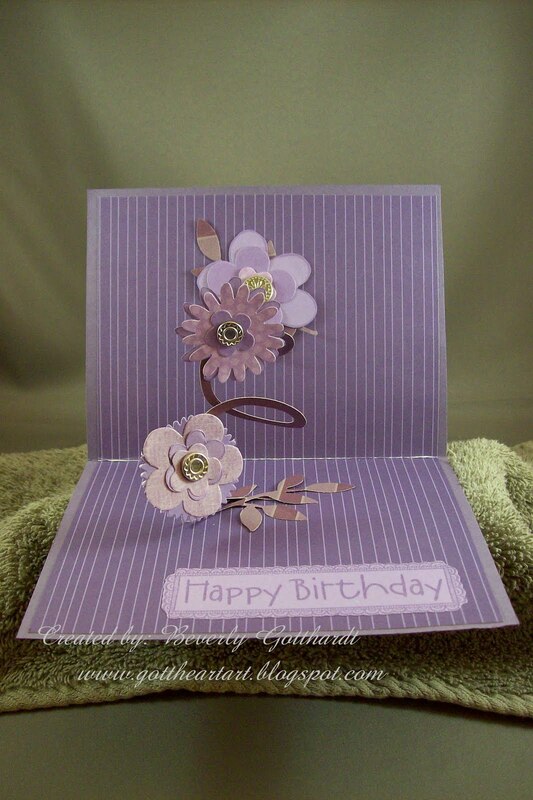 I love the pop out flowers...pretty card. Thanks for entering our challenge over at OSAAT this week. That is just brilliant Bev!! Awesome. Thanks for joining us here at OSAAT. This is so cute, Bev! Very clever with the pop up flowers. Love that sentiment panel too! Great work on the blossoms challenge. So glad you could have some fun with us this week at Our Creative Corner. Pretty card. Thanks for joining us at Polkadoodles. Very pretty card! I love the pop out flowers! Thanks for charming us at Stamp Something this week! What a clever idea - love the design. Thank you for joining us at Polkadoodles this week. Really lovely card and such clever flowers. Thanks for entering the Polka Doodles Monochrome challenge.